The Secret Origin of Animation Anecdotes. I am a huge comic book fan (even writing foreign Tiny Toons comic books at one point) so in November 1971 I joined Capa-Alpha, the first comic book apa. It was started by legendary comic expert Jerry Bails who also created the magazine Alter Ego. 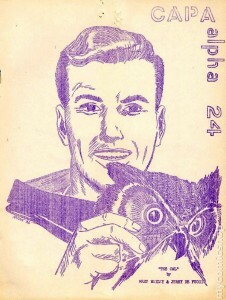 An apa is an amateur press alliance where each member produces copies of his individual zine for each member on the roster. The name of my zine was “harlequin” (all lower case) because those were the days when people tried to come up with distinctive names for their contribution like “Portrzebie”, “Ibid”, ”Fickle Finger of Fate”, “Wonderment”, just like in later years people would come up with distinctive and later regrettable names for their e-mail addresses. Another member of Capa Alpha was Michael Barrier who began a zine called “Funnyworld” that evolved into a magazine. As an aspiring actor, I had recently appeared in a school production of a completely unauthorized one act based on Harlan Ellison’s “Repent Harlequin Cried the Tick Tock Man” and liked the name and character. In addition, the name related directly to my interest in theater and the Italian comedia del’arte character. I still produce a monthly contribution to the apa (meaning over forty years of non-stop monthly contributions). 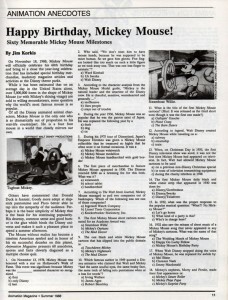 I was also a huge fan of Disney and animation and often in my apazine, besides talking about comic books and showcasing some of my own amateurish artwork, I occasionally included little bits of quotes, news and stories about animation that I found in four different Los Angeles newspapers and various magazines. 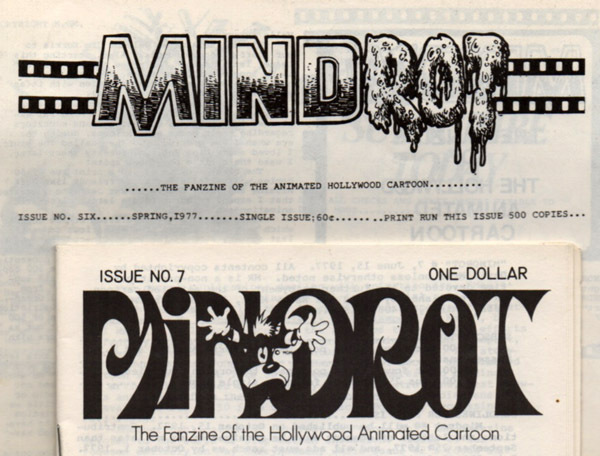 In Film Collector’s World, a monthly newspaper I subscribed to, Mark Mayerson had a column on animation and mentioned a new fanzine called Mindrot published by Dave Mruz. I wrote to Dave and offered to supply him with some of the stuff that had been appearing in my apazine. Since it came from my harlequin apazine, the column was called “harlequin” as well because I figured Mindrot probably wouldn’t last and I probably would run out of material soon anyway. So the first harlequin column appeared in Mindrot #6 (Spring 1977) and the name caused confusion for quite a few years about its relation to animation. Jim Engel eventually did a wonderful caricature for my column heading. 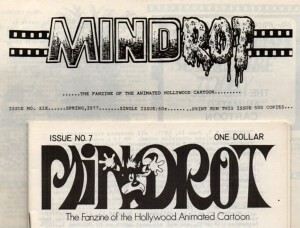 Mindrot, lated renamed Animania, lasted for another six years until issue #27 (December 1983). I did similar columns of anecdotes and news for magazines like Animato!, The ASIFA (Hollywood) Newsletter, The Comics Reader and others. I experimented with other names for the column including “Suspended Animation” and “Cel Break”. When Terry Thoren started Animation Magazine (August 1987), I was asked to write a similar continuing column starting with the first issue. My friend and writing/business partner at the time was John Cawley who pointed out that the name “harlequin” was always confusing. He suggested the name “Animation Anecdotes” because that was really what all those oddball things were. I continued to write that column for over a decade until new editorial leadership decided to shift the magazine in a different direction and just stopped printing columns I was submitting so I took the hint. Jerry Beck has been a long time friend and inspiration through all of those decades and when he decided to re-boot Cartoon Research in 2013 as a group blog, I volunteered to help him out by doing a weekly column so he could catch his breath until the site got rolling. I figured I would run out of material before the end of the year even using some older material that was still valid but at least by then Jerry would have things under control. My first Animation Anecdotes column appeared here on March 15th, 2013 – which means in a short while I will have been writing this column every week for four years (not including the extra columns I have also done). 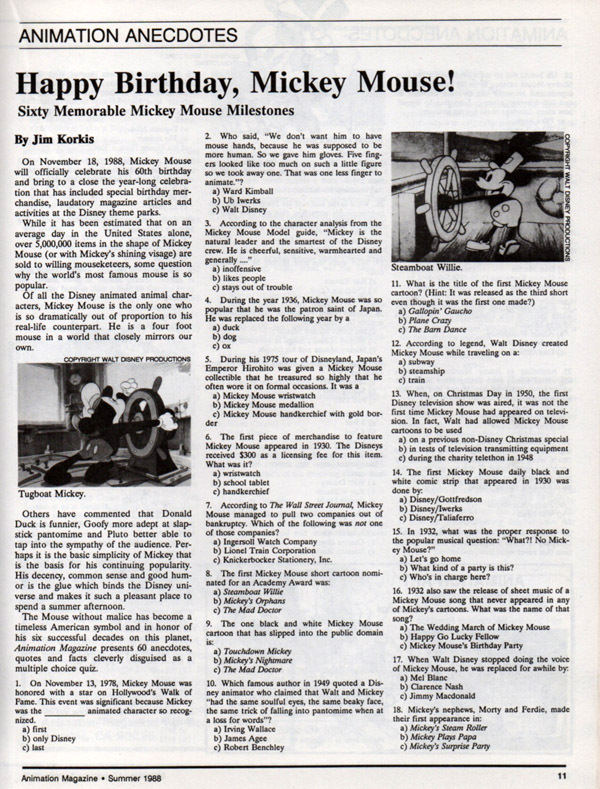 Everyone always asked if I would compile the columns that appeared in a variety of different locations into a book, so in September 2014 through Theme Park Press, I released the book Animation Anecdotes that featured some of the best classic examples from over thirty-five years of columns plus some brand new entries. The book has proven to be the worst-selling book I have ever written. The people who buy the book like it but very few people buy it in the first place. I have more than enough material for a sequel or two but that’s not going to happen. The general public no longer seems as interested in classic American animation as it once was so I am grateful that Cartoon Research provides a home for this column for those people who are still intrigued. The purpose of the column is to entertain and educate. I hope every now and then a reader goes “Wow! I NEVER knew that!” In addition, I have been told that it is a great resource site for people writing about animation which is why I have made more of an effort to include the sources for the material when possible. A Lost Filmation Production. I was actually in a Filmation production and got paid scale. In February 1982 at Filmation’s Reseda studio I was a contestant in a half hour pilot called The Origins Game with host Bob Eubanks. The premise was that contestants battled to identify the origins of words, sayings, superstititons and more. It was coproduced by Filmation and SFM Media Corp.
What made the game show unique is that there was six minutes of animation during each half hour illustrating several possible clues. 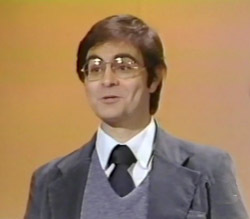 The series was conceived by Filmation’s Norm Prescott. I was invited to participate because of my appearances on other game shows including The Gong Show, The Dating Game, and Camouflague (where I won a red Cadillac) because they liked my personality and directability. I was a member of the actor’s union A.F.T.R.A. so I got paid scale (actor’s minimum payment). To break the suspense, I won $10,000 because I knew the origin of the phrase “ham actor” (melodrama actors used grease paint makeup and removed it with bacon rind and then went into bars smelling like a pig so exaggerated acting was done by ham actors). However, I NEVER received the money because it was just a pilot and it never sold. If it had sold, I would have gotten the money and my life would have been different. Later, I appeared with my family on Family Feud before moving to Florida. I have VHS copies of the game shows I’m on, which I taped off the air when broadcast. The Origins Game never aired. Here is my segment (below) – the only proof that my Filmation experience actually happened! Talk about coincidence! “Funny Animals and More: From Anime to Zoomorphics”, my Theme Park Press book collecting my first year’s worth of my Cartoon Research columns (March 2014), is also the worst-selling book that I’ve ever written. Man, Jim, you’ve got the interesting life right there! Never knew you were involved with Filmation! Too bad that show never got off the ground. It’s got a good premise, and I like the animation a lot. PS: Are we ever going to see these foreign Tiny Toon stories you wrote? I’m intrigued. After all these year, it’s nice to fianlly “meet” you, Jim! My guess is that the “Animation Anecdotes” book didn’t sell very well because the bulk of the target audience are the same people who come to this website regularly and had already read the content as it was originally posted here. Jim, I knew of you when we both participated in APATOONS, another apa-zine, when Jerry Beck was the “Fearless Leader”, and I was writing a column called “WHAT A REPULSIVE WAY TO MAKE A LIVING”. Those who know of Tex Avery, and catch phrases that Avery lifted for his cartoons, already know of the origin of my column’s title – but I appreciated Jerry and others for letting me in on this fantastic limited-edition fan publication. I wonder – Is it still active? I was once a member of an APA in the 80s and early 90s (till the internet slowly killed it). You had to make as many copies of your “zine” as there were members of the APA, plus five or more extras, and send them to the CM (central mailer), who collated all the zines and sent them to the members. Oh, and dues to cover postage. Once when I was unemployed and times were lean, I had to persuade a friend to let me use the copier at his job. Ah, Mindrot. I loved that little magazine. In those pre-internet, pre-Barrier Hollywood Cartoons, pre-Maltin Of Mice and Magic days, there were very few places for discussion of classic cartoons that were not from Disney. I found the Mindrot issue on The Fox and the Crow (late 1970s or early 1980s) in one of Ann Arbor’s used book stores and was stunned that someone has actually put something together on Columbia’s cartoons. Somewhere around here I have most of the issues, and when I come across them, am impressed by the quality of the research and writing. Your encyclopedic knowledge of all kinds of trivia served you well on that game show pilot — and it was a treat to see your handsome self the way you looked when we first met! Be assured I’ve experienced more than a few wow-I-never-knew-that moments in this column. Holy Cow! I have NEVER seen this episode of ORIGINS since it was first filmed and all these years I thought I had lost out on getting $10,000 when it was really only $2,700 which would still have made a lot of difference in my life at the time. Thank you so much, Jerry (who was so sneaky he never told me he found the clip). My folks and my fiancé (later ex-wife) were in the audience and I was very excited to be at the Filmation Studios and tried unsuccessfully to explain to them why it was so cool. I was invited to be on the game show pilot because of my “performances” on the other game shows. My memory is that the production company liked the idea of the show and tried another pilot with a different host and contestants. The last Fearless Leader (Central Mailer) for Apatoons was Bob Miller. The apa went from a print to a digital CD format and soon died. I still miss it to this day. Wish someone could print a “Best of Apatoons” Ironically, in December 2016 the last print issue of K-a (Capa Alpha) was produced and it is now in a digital only format on Dropbox. I decided not to continue with my membership. There is just something emotional and kinetic about holding paper in your hands. It is one of the reasons I still love magazines and books despite the joys of the internet. As for an interesting life, I was also a professional comedy magician performing at locations like the Variety Arts Theater in Los Angeles, Six Flags Magic Mountain (where I wrote, directed, and performed in the longest running show they ever produced, Lucky Louie’s Roaring 20s Revue which was inspired by my love of Disneyland’s Golden Horseshoe Revue), the exclusive Jonathan Club in Los Angeles and more including appearing in over 250 different theatrical stage productions as an actor and even a brief appearance in a Disney educational live action film when I was a student at Occidental College where I got my Masters’ degree. Yes, for Katie Main, I wrote Tiny Toons comic book stories that were ONLY seen in France, Spain, Germany, Italy, etc. I do have black and white copies (in ENGLISH because that’s how they were sent overseas for translation) of two of the stories I did that Katie was kind enough to send to me when I started writing so I could see what they looked like. John Costanza drew one of the stories and told Katie it was the best story he had ever been sent about Buster Bunny. I also have another with Plucky Duck as a magician. If you want Jerry to post them, let him know and I will look for them and get them scanned. Yes, I was a junior high school teacher at a public school and the parents were appalled that I wrote books (with John Cawley), appeared on television, acted in plays at the Pasadena Playhouse, ran my own outside business with John Cawley (Korkis and Cawley’s Cartoon and Comic Company) and more because teachers needed to know their place and realize that those who can “do” and those who can’t “teach”. It was an upscale district of doctors, lawyers, etc. and they have the tendency to “look down” on teachers because of their own success and felt quite at home telling the school district how it should run and why they should get special perks (like not having their kids always show up for rehearsals for school plays I was directing) and then suddenly I was there doing all this stuff and they didn’t know how to deal with it. Thanks for all the great feedback. I wanted to document the history of Animation Anecdotes but thought it might be too self-serving and nobody would be interested. Apparently, some people have enjoyed this installment. I think I have at least one more year of Animation Anecdotes in me but we’ll see. I do enjoy popping up here every Friday and am very appreciative that Jerry does this type of site and allows me to contribute. Kevin Wollenweber: APATOONS started in 1981 and lasted until #165 in 2011 – thirty years. It didn’t cease publication as much as it switched from a paper apa/fanzine format to an online discussion blog. Bob Miller probably has further information. Jimbo—Congrats on your milestone, and thanks for all the fun & info! I LOVE that one logo! Happy 300th, Jim! I’ve enjoyed many of your columns..as well as some of your books, for many years now! it is sad that many people don’t appreciate the quirkiness behind animation past these days. Don’t let that stop you from digging up what you can from those old graves, though! When I did a fanzine (Duckburg Times) my own rule was every issue had to have something by Jim. So happy he has resumed doing books. He is a true national treasure and a heck of a nice guy. Ugh! I meant only rule. I always look forward to Fridays on Cartoon Research… consistently solid each week! Congratulations and Happy 300th anniversary Jim ! Your column has been a wonderful constant for me every Sunday (in Australia here) and something I always look forward to reading. How did “The Origins Game” not get sold? This was just flat out swank.